The Research Unit Medical Informatics has been successfully integrating complex scientific methods into highly specialized medical software for more than a decade now. The strength of the interdisciplinary team working in Hagenberg lies in the development of internationally recognized specialized software. 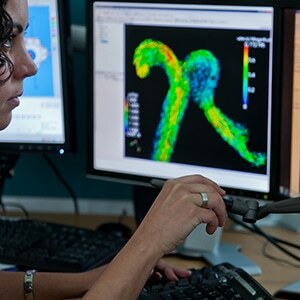 Our activities range from basic research to clinical deployable software. At the same time, we strive to take advantage of our partner network and to continuously extend it. Project results are utilized and transformed into clinically-applicable software solutions in close cooperation with our medical partners. Moreover, results of this intensive and continuous research process are not only incorporated into the software solutions, but are also presented to a professional audience at international conferences and published in scientific journals. The combination of academic research, coupled with entrepreneurial innovation and the motivation for new challenges, has turned the department into a successful R&D partner for national and international projects.